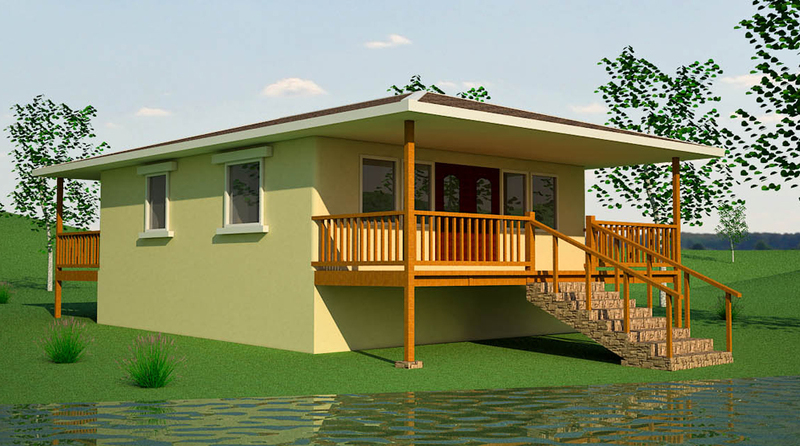 Description: Features include a deck and large window wall that faces the waterfront, and screened porch in the rear. Designed to weather hurricanes and other extremes of ocean-front property — a perfect application for earthbags, which far surpass most other building materials in terms of hurricane resistance. 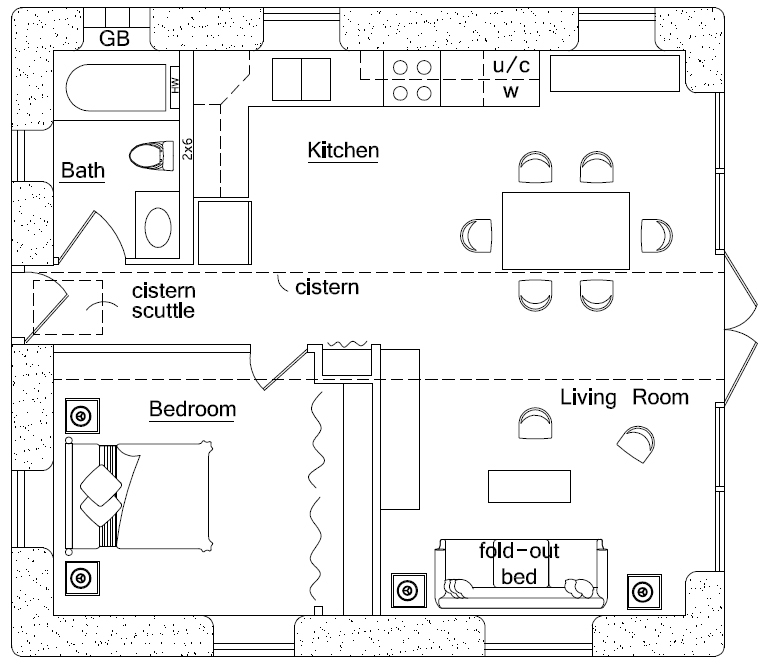 This design also includes an optional cistern under the house for storage of roofwater. how do you make the cistern? is it like a tank? is it just a cement box? or you can hold the water iside a box of earthbags? thank you so much for all your help, I am about to buid this one in the Paraná river delta as a permanent residence house. I’d located many suplyers of the bags (the open fabric ones, wich you recommended) and the cost is very low. Also, do you think I will need more than 500 bags for this house? Raise the house on gravel bags. Use poly bags (not mesh) that are double bagged, one inside the other for strength. Use mesh bags filled with soil once you’ve above the risk of water damage. The cistern as shown is gravel bags lined with cement plaster. You could make it out of concrete block or pour concrete in forms. Start on a small building to refine your techniques. For instance, gravel bags can shift, so you may have to add extra bond beams if the wall is high. This one caught my eye because of the hurricane resistant design. I live in S Florida, and would like to build a super insulated earthbag home. My goal is to become self sustaining, with no or minimal dependence on the grid. The biggest challenge is cooling, so insulation is critical and I am thinking rice hull earthbags would be the way to go. My concern, however is the strength of rice hull bags. I would expect to sacrifice a lot of strength due to the loss of mass. Strength and durability trump insulation value in your case. Use regular earthbag construction for maximum strength. Rice hull bags are still experimental and not nearly as strong.